Editor’s note: As Knoxville struggles with what to do about rental scooters, here’s what’s going on in Nashville. “I can’t wrap my head around this, that all of a sudden we’ve decided scooters are great transportation,” said the surgeon, Dr. Oscar D. Guillamondegui. If I hadn’t been there on official, journalistic observer business, I’d have been tempted to spring to my feet with a hearty “Hear, hear!” As it was, I simply thought to myself, amen. The occasion was the recent public “conversation” at the Jefferson Street Cafe to discuss issues surrounding the sudden invasion of two-wheeled nuisances, enshrined and enabled in law by the Metro Council as “shared urban mobility devices.” For short: SUMDs. An earnest panel of four including the doctor, a council member, an advocate for the disabled and a grassroots activist were collectively wringing their hands over the primarily downtown mayhem that has ensued since the scooters’ arrival last May. “On paper, we have a pretty decent policy,” said Councilman Freddie O’Connell, whose district includes downtown. Unfortunately, on paper is not where the situation is playing out. The policy’s basic rules are that riders should be at least 18, are encouraged to wear helmets, should not ride on sidewalks in business districts and, when completing a ride, should park the scooter upright someplace that doesn’t block access. 2. No one is enforcing them. “There needs to be enforcement that hurts,” he added. Tequila Johnson, vice president of the Equity Alliance and the panel’s de facto representative of the voiceless under trodden, urged that the companies behind the scooters be held accountable for infractions. And so things went for about 90 minutes, as if Nashville were somehow obliged to create a community solution to a headache that, a year ago, didn’t exist. That elusive solution would allow some companies – Bird, Lime, Uber and Lyft, among them – to continue to make lots of money. Bird, which led the invasion that forced the city’s hand, is valued at more than $2 billion; Lime at more than $1 billion. “When did it become a transit issue?” Guillamondegui, the panel’s voice for public safety, asked at one point. I think I like that guy. Nashville is not the only city facing the issue. The results elsewhere have been similarly contentious, with municipal governments issuing regulations that include limits on numbers of scooters or providers. At the state level, Sen. Steve Dickerson, R-Nashville, and Rep. Jason Potts, D-Nashville, have filed a bill that would require scooters to follow the same rules as bicycles. Knoxville is working to set rules after approving a 150-day moratorium on electric scooters in September. 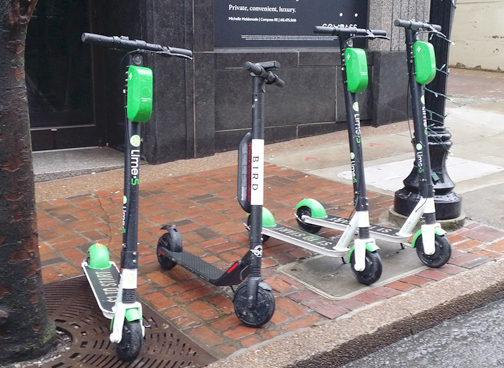 In Chattanooga, the fad is in its infancy with Lime recently gaining a license from the city. Some areas have issued severe restrictions or bans, and with good reason. On the sidewalks, scooters are a menace to pedestrians. On the streets, they’re a hazard both for drivers and themselves. A Lyft and Uber driver at the meeting said he’d almost killed some scooter riders. I assumed he meant accidentally, but I can tell you that as a downtown resident and frequent pedestrian I sometimes find it hard to resist offering a gentle reminder to riders that sidewalks are not scooter paths. By, say, extending an elbow to their heads as they zoom by. I’m joking! That would be wrong! Though gratifying. Metro’s answer to the ignoring and lack of enforcement of existing rules is to propose more, like requiring that the scooters be returned to specific docking areas, as bikes are. O’Connell wants to tack on a nickel fee per ride to raise money to offset costs associated with policing the scooters, in addition to the current $500 annual fee per company and $35 annual charge per scooter. “We have to be willing to take a step back and say, ‘Maybe we need to rethink this,’” O’Connell also said.